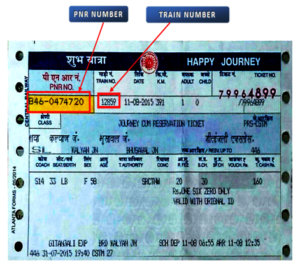 Indian railway recently launched Railway Counter ticket cancellation at online. its very easy process. many people may issuing reservation tickets like general , RAC tickets may cancellation for purpose gone to railway counter. this issue on view of railway, make it easy to reach people to launch this Procedure. 1. Enter PNR Number, Train number along with Captcha. 2. Select check box to confirm that rules and procedure are read. 3. After click on submit an OTP will be sent on mobile number given at the time of booking, enter the received OTP and click submit. 4. After the OTP is validated PNR details will be displayed on the screen. 5. After verifying the details Click on ‘Cancel Ticket’ for full cancellation. Refund amount due will be displayed on the screen. During first two hours of the opening of PRS counters on the next day for the tickets for the trains whose scheduled departure as under:- time is (i) between 18:01 hours and 06: 00 hours. 1. Cancellation of tickets and refund of fare may be permitted only on fully confirmed PRS counter tickets. 2. This may be applicable only in case valid mobile number has been given at the time of booking. 3. Online cancellation may be permitted on the tickets for the trains whose scheduled departure time is (i) between 1801 hours and 0600 hours (not in advance) and (ii) between 0601 hours to 1800 hours (same day not in advance). 4. Online cancellation shall be permitted only upto 4 hours before the scheduled departure of the train. During first two hours of the opening of PRS counters on the next day for the tickets for the trains whose scheduled departure as under:- time is (i) between 18:01 hours and 06:00 hours. 6. Passenger details (Viz.name, age, gender, booking status, current status) and journey details will be displayed on the website. 8. All the privilege/duty pass/PTOs/complimentary pass tickets may be allowed to be cancelled through website. In the case of pass zero refund is permissible however, for validity of the pass for fresh booking the passenger shall approach the counter to get the pass re-validated by marking the same cancelled against the earlier booked tickets as per prescribed rule.